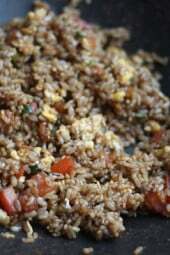 This brown fried rice is a great side dish for stir fries and Asian inspired dishes. I love to make my fried rice Thai style which uses fish sauce, but if you don’t have that you could leave it out and increase the soy sauce. This is a perfect compliment to Asian Turkey Meatballs. Double the recipe for more people. When rice is cooked, spray a heated nonstick wok with spray oil and add the eggs and cook a minute or two until done. Set aside. Spray more oil to the wok and add the scallions, tomatoes and garlic. Saute about a minute, then add the rice. Add soy sauce and fish sauce, stir to mix all the ingredients. Keep stirring a few minutes, then add cooked scrambled egg. Adjust soy sauce if needed to taste and mix well another 30 seconds. Can I use peas instead of tomatoes? I made the brown rice according to your instructions above. It took over an hour to not be crunchy and was gooey. I'm aaawful with brown rice. That being said the end result was very yummy. I used peas/carrots instead of tomatoes. Thanks! Any suggestions on the brown rice initial cooking? This sounds really tasty, definitely going to try! 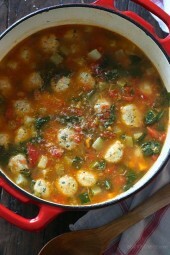 Question…have you ever used bulgar wheat for something like this or any of your other recipes? 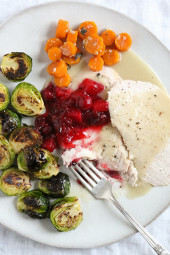 Making this tonight with the Asian glazed drumsticks!! Can't wait!! Would this recipe work if you omit the fish sauce? I have annoying seafood allergies. Thanks! Hi Gina,Yor recipies are so amazing!!! I am making this woth the seasme crusted chicken tenders. Thanks Gina!!! would this work with brown basmati rice as well? i have both that and regular brown rice but would like to use up the basmati rice, as long as it doesn't compromise the recipe. I like to soak my brown rice at least an hour or more before cooking. 1 cup rice, 2 cups water and salt and bring to a boil. Cover pot and simmer on low for about 40 – 50 minutes. Test it to make sure it's done, then fluff with a fork. Do you mind posting about BASIC Brown Rice Recipe. I can't seem to figure it out!. I have seen different packages direction and different internet recipes… Do you have ONE that WORKS!? I just updated the points plus. Are the smart points the same now in 2017?? Are the points listed on this, the old WW? Yes, I love leftover fried rice. I just discovered this blog and I'm so excited to try all these recipes! For this rice, do you think it will taste good reheated the next day too? A deep skillet would work, on high heat. Hi Gina! Is it possible to cook this in something other than a wok? If so, what pan and what level of heat? Thanks!! When printing, it doesn't include the ingredient list. I printed it from Safari,and then checked it on my comp using Firefox. I'm sorry, yes, non stick oil. I use a misto and fill it with my own oil but store bought would work. Hi Gina, not to sound dumb, but so be it..
"Spray oil" What exactly does this mean? Is this just non-stick spray? Or something else? I know vegetable oil (and all oils) are fatty, so what I should use? 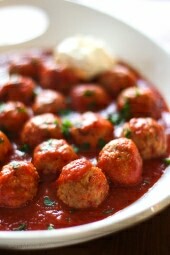 I'm dying to try this delicious-looking recipe!! 🙂 Thanks! This was sooooo good! I added turkey sausage and mushrooms to make it a complete meal – yum. Thanks again Gina. 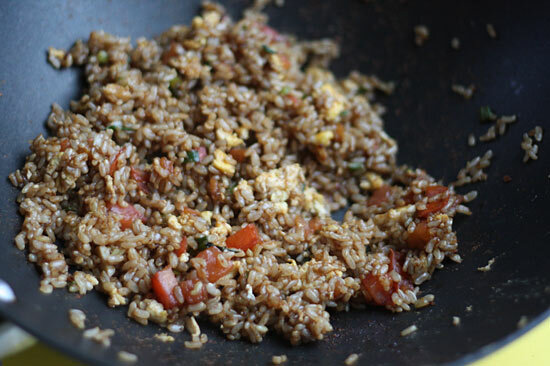 this sounds amazing – great alternative to the white fried rice my hubby loves so much. i'll definitely have to try this! @Sarah- I'm not sure about Singapore but the scallions here in the states are green onions, not terribly large. Chives are very thin, like a blade of grass. This recipe can be made with onions instead, the tomatoes are great in the rice, but have fun with this, use whatever veggies you have in your fridge, peppers, carrots, etc. Linda, great idea, I'll post one soon! Gina, you're amazing. Thank you! All your recipes are amazing. Do you have a recipe for Asian Style Lettuce Wraps? I've never considered adding tomato to fried rice! So call me a bit dumb these days, but I've recently started wondering about the difference between scallions, spring onions, and chives. In Singapore what I used to think was a scallion is called a spring onion. There are these huge versions of them that are labeled Chinese scallions (but are those actually scallions???) and then there are chives, that look like spring onions, but are flatter…so what should I be using? I typically go for the spring onions, but if I should be grabbing the humongous Chinese scallions, please let me know! I think scallions and spring onions are the same, chives are much smaller. I wonder if quinoa would be a good substitute for fried rice?